Located in North Hall, a 1907 auditorium built for Boston Girl’s Latin School, the space incorporates Palladian windows and a reproduction of the Parthenon frieze. In the 21st century it received extensive renovations and was reborn as the Pozen Center. The primary purpose of the Pozen Center for Interrelated Media as a MassArt facility is educational. It is the main laboratory/ studio/classroom for programs in the Studio for Interrelated Media Department. As one of the few flexible multi-use art spaces in Boston, the Pozen Center is also an important community resource. It is made as available as possible to the members of the MassArt community and Boston at large in a manner that respects its educational mission, protects the safety of the users and the equipment of this technical production facility. 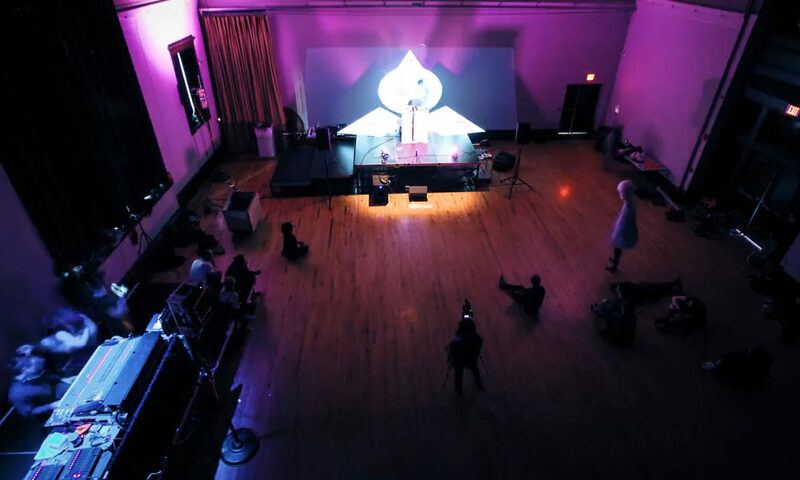 The natural light and hardwood flooring makes it an excellent space for exhibitions, but it can also be darkened for projections, theater productions, dance performance, film screenings and multimedia events. To book usage of the Pozen Center, first contact Claudia LeClair. She can provide information regarding availability as well as group rental prices. All groups using the Pozen Center must hire a student tech assistant from the Studio for Interrelated Media (SIM) Department to provide key access, inform the group on how to use the space safely and ensure the space is returned to its original state at the end of the event. House lighting, chairs and a powered podium are provided with the space usage. MassArt now requires that all events on campus register with an administrative Event Registration Group. The student tech person can also assist in making sure the event is registered properly and public safety has the event on record. Lighting design and installation may be provided by the SIM technical staff for an additional fee. Please discuss this with the SIM student liaison and Studio Manager when you are filling out the Pozen Usage Request form. If required, additional output, stage monitors or sound mixing capabilities for more complex musical programs can be rented from the SIM Department. Please discuss specific needs with the SIM Studio Manager or student liaison. The SIM Department can provide projectors, video playback and monitors as well as videotaping services. Check with the SIM Studio Manager or the student liason if videotaping the event or video services are requested. The Pozen Center has wireless and wired network connections at various locations throughout the space.